Note: A discussion about the “grumpy old man” who used to hitchhike from Arcata to Orick cropped up on a Facebook page titled “Remember In Arcata When…” The grump was Johnny Antonioli, who passed away Feb. 24, 2003. Here’s a profile of “Orick Johnny,” which first appeared in the July 5, 1995 Arcata Union newspaper and was later updated and reprinted in the Arcata Eye on his 80th birthday. ARCATA – Frequently sighted as a sprawled heap on a roadside lawn, or waddling backwards up a freeway onramp with his thumb out, the Arcata fixture known to many as “Orick Johnny” or “The Mayor of Orick” is a man of myth, mystery and misunderstanding. John Antonioli’s gruff demeanor and soiled garb keep most at a distance. His apparent distaste for casual chat has fostered an air of enigma around the grizzled octagenarian. Rumors of vast wealth and dreaded disease abound. Even friends and associates around town fill in the blanks with speculation and imagination. “He’s very affluent,” said one unofficial town historian and Johnny-watcher, reflecting a common belief. “Looking at him you’d never know, you’d think he was the town scrounge.” More conventional wisdom ties Antonioli’s supposed fortune to extensive land holdings, while he wanders the streets homeless. Still another of the oft-told tales apparently stems from Antonioli’s gnome-like stature and labored gait, the supposed legacy of a ruinous disease contracted as an infant. Antonioli does nothing to feed or deny the speculation. “I don’t like to be bothered,” he says with his characteristic croaking growl. For Johnny, the truth is as simple as the life of a child born into a rural logging community in the 1920s. A miserable storm was pounding Orick in April, 1921, recalled a family member, when Johnny fought his way into the world. A city doctor could not be summoned to the Antonioli’s remote Orick farmhouse in the hazardous travel conditions, so an inexperienced midwife got the call. “She wasn’t skilled,” said the relative. “Mother labored too long. When Dr. Purlenky drove up from Arcata he was mad. He said, ‘John will always be slow. '” Johnny’s early years were spent with his parents, two sisters and a brother toiling on the family’s dairy farm. A working childhood included the clearing of rangeland for pasture and other chores. Reading, a lifelong passion, was cultivated early at Orick School and by home tutors. When he was just 10 years old, an accident with a double-handled draw knife changed Johnny’s life. “He was whittling and he cut his knee,” and Antonioli’s sister, Elsie Pialorsi. “After that, he couldn’t do too much.” Permanently severed tendons hobbled the youth, imparting Johnny the exaggerated saunter he has become known for. Johnny hitchhiking on Seventh Street near his A Street home. Friends recalled Antonioli’s yellow Studebaker pickup, in which he regularly traveled up and down the Redwood highway. A favorite destination in post-war times was a long-gone beer and burger joint called the Little Red Hen near Freshwater Lagoon. He still speaks of the truck and wishes to acquire another, said Pialorsi, but that’s not likely. In the ’60s, Antonioli took up residence in Arcata, living in a home owned jointly by relatives. A small trust fund, not a real estate empire, makes ends meet. “He’s comfortable,” said lifelong friend Lily Ghidinelli. Through decades he has pursued his regular routine of downtown stoop-sitting, roadside napping and near-daily hitchhikes to Orick. “He just keeps going back and forth, back and forth,” said Ghidinelli. “Everybody seems to pick him up,” said Pialorsie. “They know he’s not harmful.” Johnny’s social skills fall into the “charmingly rough hewn” category. One helpful driver reported being rewarded for a lift to Orick with a cigarette ground out in his seat upholstery at journey’s end. Antonioli’s unkempt appearance may inspire sympathy, but for Johnny, any attention is a nuisance. “He’s not a very clean-cut guy,” said Ghidinelli. “They’ve tried to make him change, but he won’t.” “I’ve known him since 1949 and he looks the same,” said friend Don Kolshinski. “He’s got more gray hair now, but he really hasn’t changed,” said Ghidinelli. 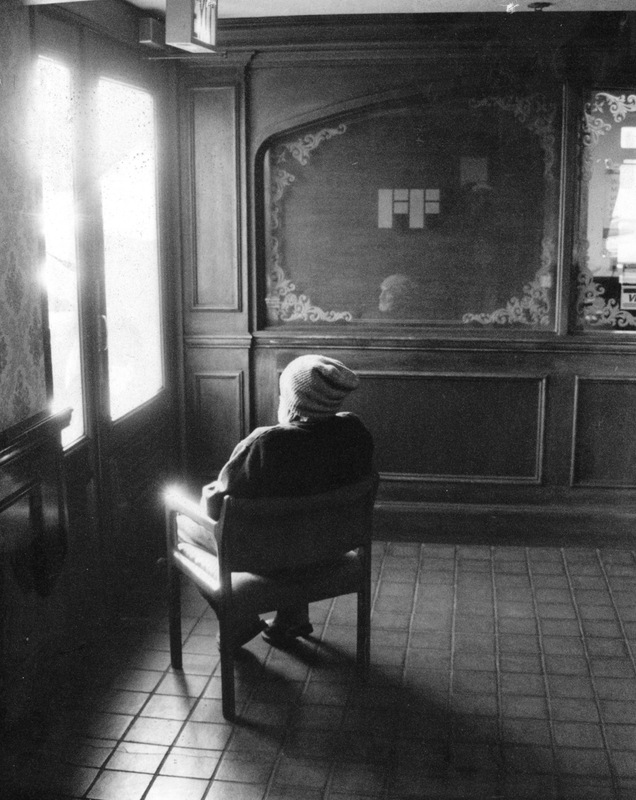 His apparent timelessness and steady routine seem to comfort townspeople. “We can usually tell what time it is by seeing him on the lawn out here,” said one City Hall worker of Antonioli’s napping regimen. Johnny liked to nap in the sun, sometimes in insalubrious, or at least uncomfortable circumstances. 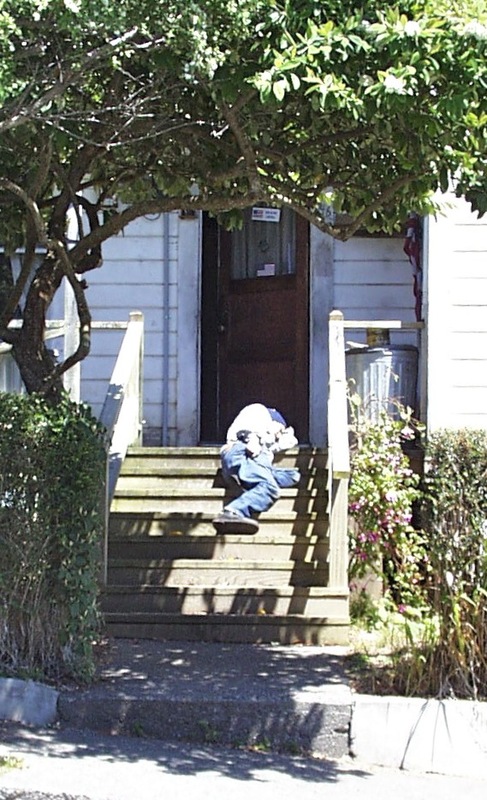 One July day in 2003, he took a snooze on his front steps. The opinionated Antonioli recalls a prettier Plaza in a booming Arcata, and cares little for the change from logging capital to college town. As far as Johnny’s concerned, Humboldt State University is the town’s biggest problem. “The college ruined Arcata,” he said. Antonioli surveys the town from various curbside vantages and keeps tabs on world affairs. “He’s smarter than you think he is,” said Pialorsi. Also fluent in Italian, the inveterate reader consumes several papers daily. This entry was posted on Friday, August 10th, 2012 at 3:18 pm	and is filed under Community, History. You can follow any responses to this entry through the RSS 2.0 feed.